A "Hippy Dippy Weather Man" came into work today. Joseph tie dyed an Arkansas Inland Maritime Museum t-shirt and wore some homemade bell bottoms. We hope everyone enjoys the holiday and stays safe. Remember that after all of the festivities this weekend you get an extra hour of sleep on Sunday with the time change. The museum will begin to close at 4:30 starting Sunday. In April 1862, the Confederate Navy Department enthusiastically sought to replicate the victory of their first ironclad, CSS Virginia, against the Union’s wooden hulled blockaders. This was finalized with the Confederate ram, CSS Albemarle. Constructed to assist in the North Carolina sounds, this ram was armored with eight 30-degree angled sides, and included two 6.4 inch Brooke pivot rifles stationed in three different fixed positions. These cannons were protected by six iron shutters, mounted on all sides. The ram was propelled by 3-bladed screw propellers that were powered by steam engines. Albemarle was constructed throughout 1863-4 and was commissioned in April 1864. Albemarle was a powerful tool used by the Confederacy, and a terror to the Union Navy. Two plans were submitted by Lt. William B. Cushing in an attempt to destroy Albemarie. Locating two small steam launches, Cushing fitted each of them with spar torpedoes. Spar torpedoes consisted of a bomb that was placed on the end of a long pole, or spar, and then attached to a boat. The goal was to run the bomb into an enemy ship. Some spar torpedoes were equipped with a barbed spear in the end, so it could stick to wooden hulls, and then a fuse would be lighted to detonate. The night of October 27, 1864, Cushing took his small steam launches upriver towards Albemarle, who was anchored up the Roanoke River at Plymouth, Virginia. Under the cover of darkness, they were able to sneak past the guarding boats undetected to surprise Albemarle and ride up to place the spar torpedoes against the hull of the ironclad. The explosion was detonated and she sank immediately. The spar torpedoes were the latest invention in submarine evolution. The torpedoes are the next evolution of technology for submersibles to destroy an enemy. Unfortunately, with budgetary constraints prevalent by World War II, many boats were equipped with under-performing torpedoes that would either not detonate, or could not be controlled to hit an enemy boat. It was evident after World War II that new technology for torpedoes needed to be developed to keep up with the newer boats and ships of the time. USS Razorback, located at the Arkansas Inland Maritime Museum in North Little Rock, Arkansas, also saw the evolution of technology development in torpedoes. Razorback started with the unreliable World War II torpedoes, the Mark 14, and was soon after introduced to the Mark 37 torpedo. The Mark 37 used electrical propulsion rather than pressurized air to launch from its tubes, and was guided with a gyroscope, a passive sonar homing system and a Doppler-enabled active sonar homing. Like Albermarle, without this superior technology, the results during war could have been drastically different. Photograph courtesy of U.S. Naval History and Heritage Command. On October 12, 1914, the USS Jupiter (AC-3) became the first United States Navy ship to complete the transit of the Panama Canal. Built in 1911 at the Mare Island Navy Shipyard in Vallejo, California, and launched August 14, 1912, Jupiter was originally built as a collier. A collier is a ship designed to carry coal for naval use by coal-fired warships. These bulk cargo ships were noted for their flat-bottom hulls and sturdy construction, which assisted them well in transition. They served the Navy until the invention of aircraft carrier hulls that were built for this specific task. 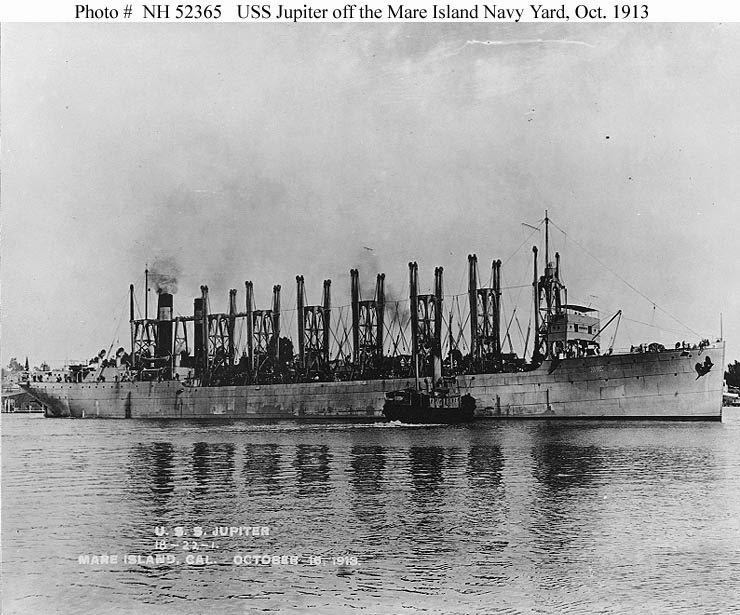 Jupiter reported to the Pacific Fleet in Mexico on April 27, 1914. She assisted the U.S. Navy during the Veracruz crisis, remaining there until October 1914. She departed for Philadelphia, Pennsylvania, on October 10th. En route to Pennsylvania, she steamed through the Panama Canal on Columbus Day to become the first vessel to transit from west to east. From the Naval Yard in Norfolk, Virginia, she was converted into the first United States aircraft carrier to assist with conducting experiments in the new experimental phase of seaborne aviation. She was renamed USS Langley, and reclassified as a CV-1. She officially was re-commissioned on March 20, 1922. 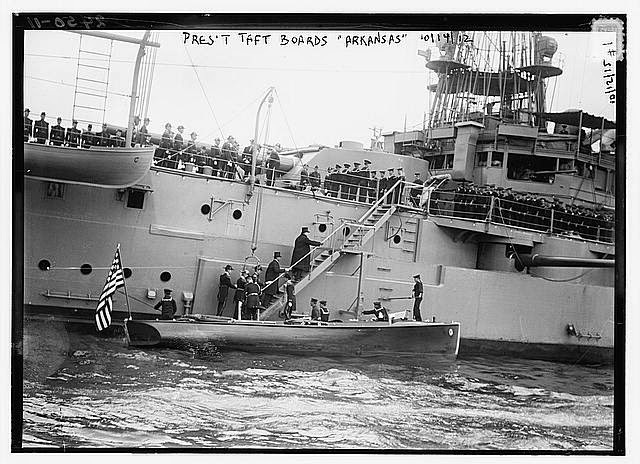 On October 14, 1912, President Taft traveled to the Panama Canal for inspection aboard USS Arkansas (BB-33). Arkansas did not transit the canal until July of 1919. The battleship made this transit multiple times during her service in the Navy. Like Jupiter, Arkansas made the transition through the Panama Canal to join the war effort in the Pacific Ocean. The Arkansas Inland Maritime Museum displays an exhibit about Arkansas's service from 1912 through 1946. Visitors can browse the museum exhibits about the battleship and missile cruiser ships named after the State of Arkansas as well as a World War II submarine, USS Razorback (SS-394). Today, the museum honors the victories and the brave men who fought during World War II. Come on down to North Little Rock, Arkansas, and take a tour to see the history for yourself.